I want to start out today’s review with a slight apology. 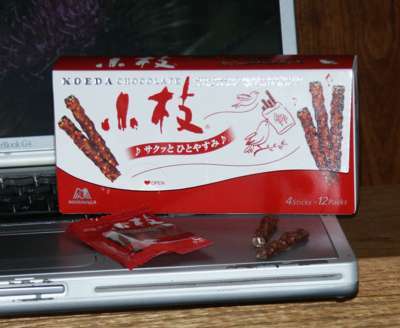 A while back I did a review for Koeda Chocolate (orange) which I originally called just “Koeda Chocolate” because that was what was on the package that I could read. I = Japanese illiterate, which can in cases like this, cause some confusion. I have since gone back and sub named the first Koeda as Koeda Chocolate (orange), perhaps wrongly, because with today’s review I discovered that Koeda Chocolate isn’t the name of that particular JSF but the name of a kind of JSF of which there are two flavors (orange?) and (milk). If there one thing that tickles me pink about doing these reviews that would be finding a whole mess of flavor variations within one JSF company on a central JSF theme. The second would be finding a different brand that did the same thing. So today I bring you flavor two of Koeda Chocolate: Milk! The only things I can compare are the packaging and the rice crispy bits because one is white chocolate orange while the other is chocolaty chocolate. That’s like apples and oranges: Both fruit but nothing alike. So! Packaging. If I liked the twin sticks of Koeda (orange) than I can’t tell you how *squee* the half sized cute little Koeda (milk) packaging was. I’m a sucker for miniaturizing things and even though these are most likely full sized Koeda chopped in half and packaged in short 4/package packets, they’re so Kawaii!!!! Eeee! Tiny wonderfully crispity chocolate sticks! Once I got over my delight at the tiny packaging, it was onward to the tasting. Chocolate? Yum! And this is a good dusky cocoa-y Japanese chocolate too. They label it as ‘milk’ chocolate but anyone who grew up on Nestles or Hershey chocolate would tell you that Koeda (milk) leans more toward the dark chocolate of the American palate than the milk chocolate. I rather like that about Japanese chocolate. I and my Guinea Pigs all agreed that the chocolate was a good, solid, deep, coca-y chocolate and tasty to boot. of 4 Wasabi Peas out of a possible 5.